Pictures and Progress: the Black Panther 1966-2016 will open November 10 on the 3rd and 4th floors of UC Santa Cruz’s McHenry Library. The Black Panther Party was officially formed in 1966, shortly after the creation of Marvel’s Black Panther character. Looking back after 50 years, two interconnected exhibits will examine the role of women in the Party and the comic. Thirty photographs by Pirkle Jones and Ruth-Marion Baruch, ephemera, and original posters by Emory Douglas comprise one part of the exhibit. Forty-five comics, portraying the Black Panther character and African Americans in the second half of the 20th Century, form the other. 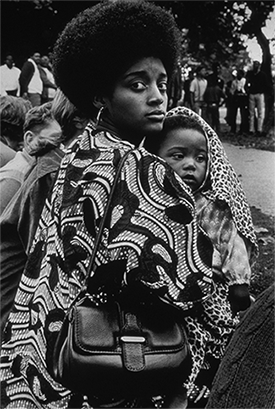 There is also a digital component to the exhibit that includes supplementary pictorial materials and essays by each of the curators, addressing roles of women and children in the Black Panther Party and the comic. The curators--crystal am nelson, Cathy Thomas, and Kiran Garcha--are all Ph.D. students at UC Santa Cruz. A comic book about the Black Panther comic, commissioned and created to accompany the exhibit, will be available to visitors free of charge. The exhibition runs through April 1, 2017. For more information, contact Elisabeth Remak-Honnef, head of Special Collections and Archives at McHenry Library, remak@ucsc.edu or (831) 459-2459.